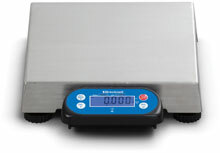 The Salter-Brecknell 6700U Series POS Scales are designed to be used for linking to electronic cash registers or computers. The 6700U Series is legal for trade, and commonly used in convenience stores, cafeterias, deli's, candy stores, coffee houses or other retailers where counter space is limited. The display is wired to the scale and there are optional front mounting kits and pole mounting kits that can be purchased separately. Cable, RS-232 (Serial), 9 Pin Male/Female Pass Through, 10 feet, Compatible with 6700u Series. Display bracket attaches display to scale base - for the 6700U Series. 1.8 m / 6'' USB A to A cable - for the 6700U Series. Remote display kit with 305 mm / 12" post and 2 m / 7'' cable - for the 6700U Series. The Brecknell 816965005871 is also known as Brecknell Scales	816965005871	.